Convert Video to Any Video Format and Enjoy your favorite videos and movies on iPad, iPhone, iPod, Apple TV, PS4, etc. Pavtube iMedia Converter for Mac is a powerful digital video converter that lets you convert video to virtually any format. Convert directly to optimized formats to play on new iPad Pro, iPhone 7, Apple TV 5, or other mobile devices. Also convert to common video formats like WMV, AVI, MP4, MOV, H.265, MEU8, FLV, etc. Enjoy your favorite videos and movies on iPad, iPhone, iPod, Apple TV, PSP, etc. Convert videos to almost any video and audio format. Optimized default output presets for iMovie, FCP, etc. 1. Resize video or tweak settings (resolution, frame rate, encoder, bit rate, etc.) and you can save the settings for future use. 2. Take a snapshot from any frame of the video to capture your favorite scene and save it in JPG image format. 3. Allow you to convert commercial DVD and Blu-ray with one of existing subtitles, audio tracks s or without subtitle. 4. Trim a big video or DVD and Blu-ray movies into several parts and get the videos clips, either for viewing on mobile devices or for use with video tools. 5. Allow you to merge several video or movie files into one so that you can enjoy a long movie without interruption. 6. Crop the image to unwanted backdrops, black borders or to emphasize a particular focal point. 7. Quickly convert HD video like AVCHD MTS/M2TS, AVCHD Lite, TS, HD MKV, HD WMV, HD MOV and standard videos to any popular format including WMV, MP4, AVI, MOV, MPG/MPEG, FLV, MP3, and more. 8. Straightforward presets make converting video to fit iOS devices a snap. Enjoy your videos, movies and TV shows on new iPad, iPod, iPhone (iPhone 7), and Apple TV 4 (1080p output video available). 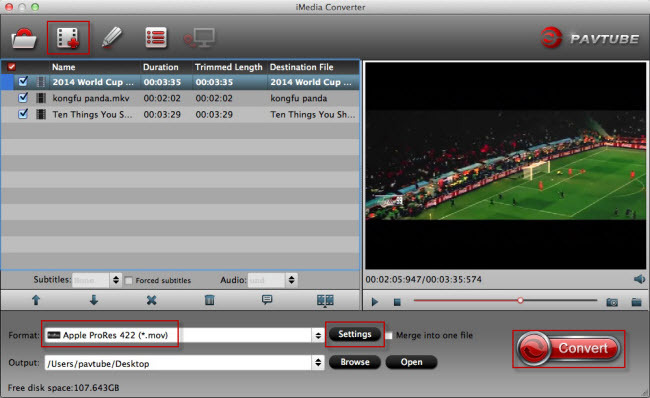 iMedia Converter for Mac is an easy-to-use multimedia tool to convert DVDs, Blu-rays and Videos to any format video of your choice, with high conversion speed.